Thanks for taking the time to post your review Oscarmax, much appreciated. Did you find the transition from manual handbrake to electric handbrake relatively easy? How do you & your passenger find driving roads round corners, is there much body roll? In regards to the heated windscreen, ford had patented the technology so that’s why they were only on Fords, but that patent expired a while ago, yet other manufacturers seem slow on the uptake. I would have liked them to go a step further and make the front side windows heated as well… how useful would that be, and if they can heat wing mirrors and windscreens, why not the side windows. I now know what too look at when I get my Kuga. Good review. 1. Being an automatic the electric handbrake is brilliant, I put foot onto the brake and put into gear and switch the electric handbrake off, you can drive off with the electric handbrake on but it is a bit jerky, probably the same as a manual handbrake. When you stop reverse the procedure just like a manual handbrake. 2. 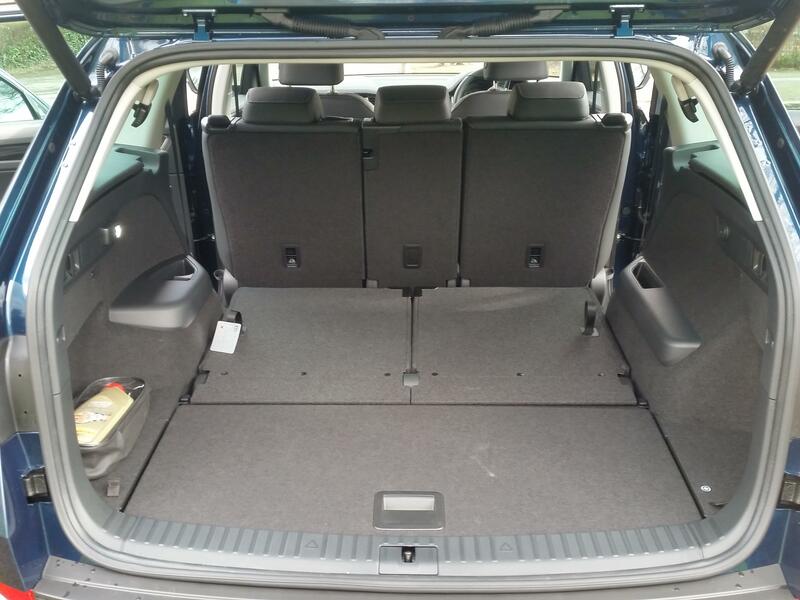 Virtually no bodyroll, very good for a SUV and far better than the later Honda CRV. My mobility car is the 4 wheel drive, I have not driven the 2 wheel drive. It is very sure footed through twisty bends with poor camber. The wife has always been a nervous passenger, but seems quite happy in the Kuga. 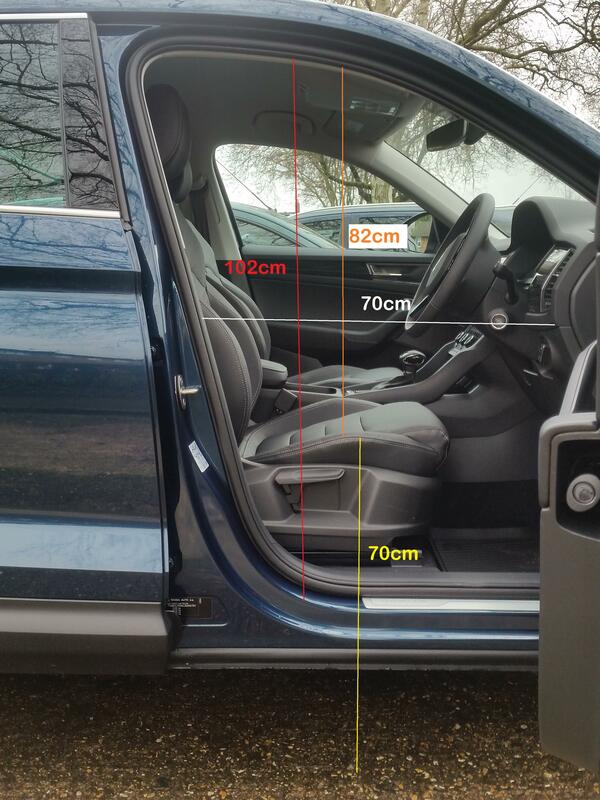 As regard the heated windscreen I think the VW Tiguan has a £300 option. Big Bear your Kuga will have all the toys which my Kuga Zetec unfortunately does not have. I have had a test drive of the 1.5 180 petrol AWD auto lovely engine the petrol auto use a torque convertor as apposed to the powershift, the auto in the petrol seems smoother. This reply was modified 1 year, 1 month ago by Oscarmax. Yeah. I had a long test drive in both. Petrol Vignale and diesel ST. Had a diesel Sorento for 12 years and it was like a tractor. We need the AWD for where we live and that was not available in diesel with the Vignale and I found the ST suspension too hard with the 18” wheels and my back could not handle it. Vignale is so comfy it’s like sitting in your couch. Can’t wait and probably won’t sleep until I get the keys in my hands and drive away from dealers. Thanks Oscarmax, that’s very helpful. I can also say i really enjoyed my 3 years driving my power shift Kuga Diesel although i have the more powerful version. The car in my opinion is very very comfortable. 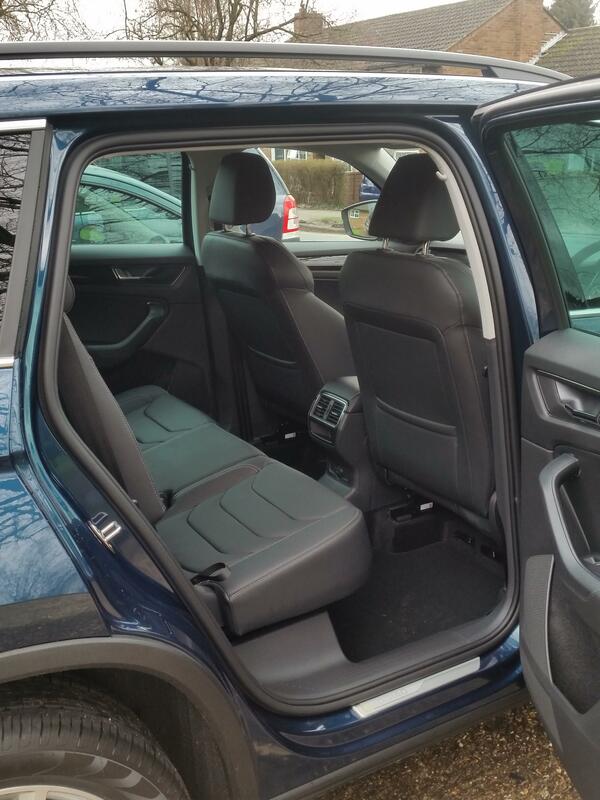 As my car due for a change i decided to go for the Tiguan however i had to look at the SEL as i found the lesser spect Tiguan seat not up to the task. I will miss the Kuga it never missed a beat in my whole 3 years of driving. I can only hope the Tiguan lives up to the enjoyment and drive of the Kuga. I still have the Kuga until the Tiguan arrives on the 7th of June. Great review Oscarmax thanks for sharing, I’m sure many are keeping a keen eye on the Kuga, I’m also looking forward for the race on the many Tiguan orders that Forum members are waiting for and of course the much awaited Seat Leon’s and whether members think they were worth the wait and lived up to expectations, Kuga wise your Mpg I’m sure will be a relief to many as I was under the impression it would be worse. I thought I would add something to my review. I have found I can now pull out of junction with more ease, just I prod of the throttle and I am out of junction or off roundabout, the transmission change 2 or 3 gear in seconds, just so much easier than a manual. The Kuga comes standard with cruise control, but also has a speed limiter button, I tend to use this a lot in 30 and 40mph zone, I can concentrate on the road conditions rather than watching the speedo. If you do pick up speed going down steep hill an alarm sounds as a warning. Unfortunately I only have rear parking sensors, I would love front parking sensors and a rear camera like my Honda. I recently purchased a rubber/plastic boot liner from ebay to keep the boot cleaner, I have a mobility scooter. Do you have a visual aid with the rear parking sensors? I found that very good, only have audio warning in the Leon. Yes I have the visual aid, for some reason my Kuga came with satnav which has a large screen, it just a shame Ford have not updated the satnav. I also have a setting which displays your speed in digital numbers between the Speedo and rev counter. Very nice, must admit i use my centre screen to display the digital speedometer, a lot easier on the eye than reading from a dial. I only change this when using the satnav as find it’s better positioned there, than over to the left on the bigger main screen. I don’t drive at night so its no problem, I don’t think mobility would be happy teddy bears if I messed with their lights. For those who drive at night they wish to pay for the upgrade, or go for the Titanium or above. Last May when I received my mobility Kuga is was subject to the rice cap. Just out of interest Ian when did you order your Tiguan ? This is my first impressions review of my new Skoda Kodiaq. Firstly, getting in and out is very easy, the four doors open virtually to 90 degrees. Legroom is not a problem in this car. With my driver’s seat set, sitting behind the front seat I’ve still got, 6 to 7 inches between my knees and the back of the seat. Although seats 6 and 7 would need to be reserved for children or people on the smaller side. Getting out is now a pleasure, not a pain. I’m able to swivel my legs around and literallystep out now. Once inside, the leather seats are very comfortable with plenty of adjustment, so setting the driving position is easy to accomplish. 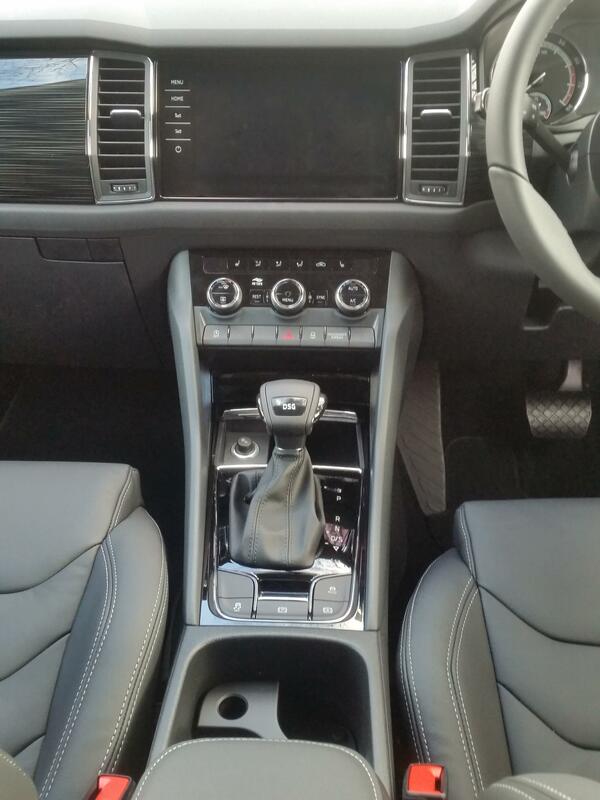 The dash is well set out, and the 9.2” touch screen is very responsive and immediate. Really well set out and easy to navigate and offers a lot of personalization. Vehicle and driving data is clearly displayed, which I’ve found helpful, although a lot more reading of the manual is needed!! 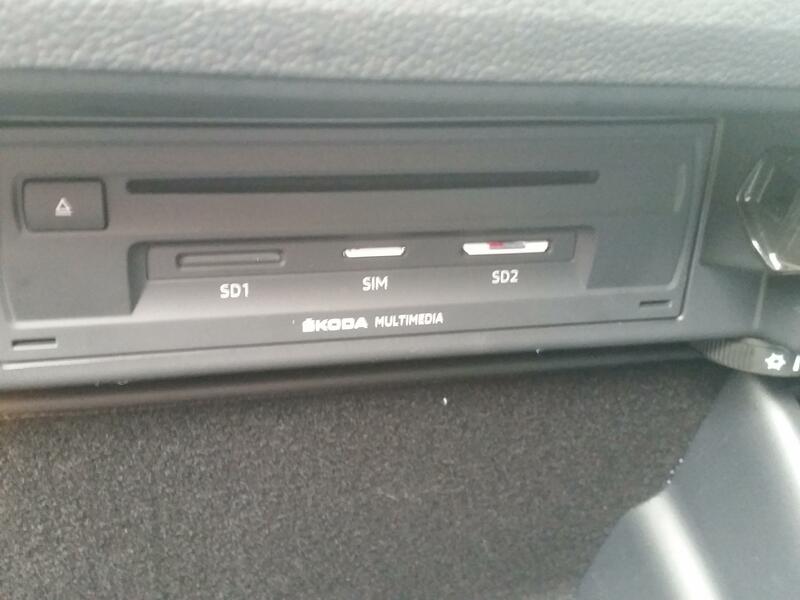 In the main glovebox (yes there is two, one of which is a cool storage) there is a CD/DVD player plus two SD card slots, and a sim card slot. I’ve now got nearly 350 albums available, plus 10Gb of favourite music in the cars own memory which Skoda call the jukebox. I’ve installed a prepaid data only sim card which gives me internet connection. The use of this, is to give up to the minute travel, traffic and roadwork updates. Plus, weather and other news. This comes in handy when you set a destination in the satnav. It will tell you all traffic hotspots on the way, and the weather on route and at the destination in real time. So far, in 4 days it’s used 9mb, will use more when Google map view is selected. Keyless entry and push button start is new for me, but simple and easier to do than faffing around with a key. I noticed straight away how quiet the 1.4 petrol engine is, I even turned the radio down to make sure it was still running!! The 6 speed DSG is lovely and offers a smooth ride, although where I live is on a hill and when starting from cold, it sometimes holds 2nd gear a bit to long. The steering is positive and responses immediately to turning. Suspension is well set, not to stiff and not to soft, body roll is almost non-existent for such a large vehicle, all making for a very comfortable ride. Driver mode settings are easy to do with a press of a button. I’ve had it mostly in normal mode, but switched to eco as a trial, but in all honesty, it didn’t make the MPG any better and I felt it made the gear change a bit jerkier. Sport mode is amazing, really turns the car into a different animal. It is truly amazing how a 1.7-ton lump with a 1.4 engine can be propelled at such a speed. Mind you the fuel gauge goes in the opposite direction to the speedo! Other nice touches are the umbrella’s in the front doors and the removable torch in the boot. Plus, a full set of nets to store all sorts of things. There’s so much more to say, mainly about gadgets, Skoda Connect etc. But I’ve droned on long enough….sorry. 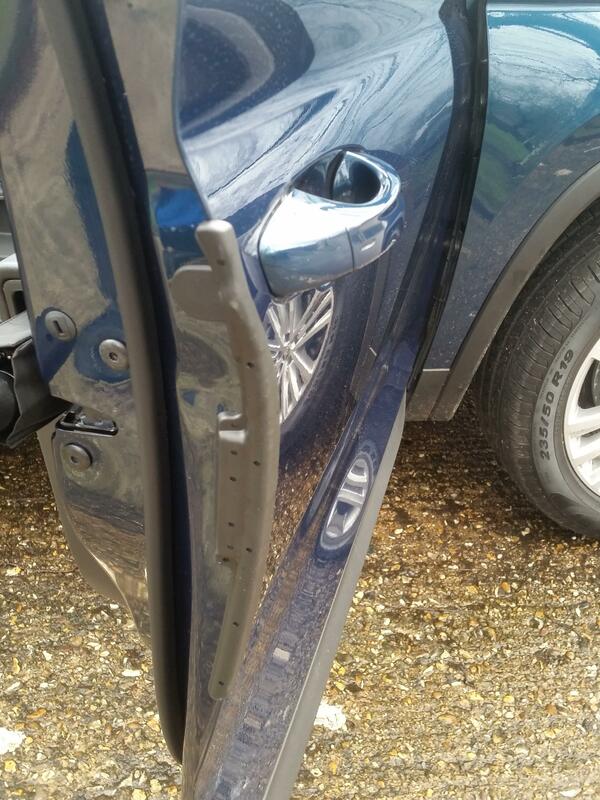 Would just like to add the door protectors, love them, so blood clever!! Very nice Mm,what a great colour too also the umbrella is a nice touch . one question mm for you that’s puzzling me is your mobile sim card can you still pair your mobile phone to the audio or is it a case you your phone treats the SIM card as a wifi hotspot.??? It does look one amazing vehicle, love how they’ve taken the umbrella thing from the superb as well. Happy driving, be interesting to hear what mpg you’re getting a couple of months down the line – stay in touch. Thanks Trev, it was a labour of love really, writing about my new pride and joy. At the moment there are no plans for me to move in, but the wife said if I don’t start paying her some attention, that could all change!! MPG at the moment is 33.6, but that’s been all short town driving and a tight engine. Hopefully that’ll go up once I get her out on some longer journey’s. Bulldog, the grin just won’t go, think we must be like a pair of grinning Cheshire cats you and me!! In answer to your question. Yes you can use your phone connecting by usb cable to create a Wi-Fi hotspot. But I’m a cable hater and it’s much easier to use a data only sim card. Pre-paid £40 for 24gb on three network which looking on consumption so far will last a couple of years. Also have the option to have connected to the internet, or not. Another thing I have to bear in mind is that having taken 20 odd tablets a day for the last few years, I’m very forgetful and often leave my phone at home!!! Well done we are now getting some real life reviews, excellent work. Well we have taken the caravan out for the first time this year, the Ford Kuga is now approaching 12 months old and 7000 miles to date NOT one problem the Kuga has been 100% reliable and has not use a drop of all which is amazing. We have fitted a rubber tray/mat which we brought on eBay in the boot to protect the carpet and a Ford dog guard, although we strap the mobility scooter down the last thing we want in the scooter entering the passenger space in the event of an accident. 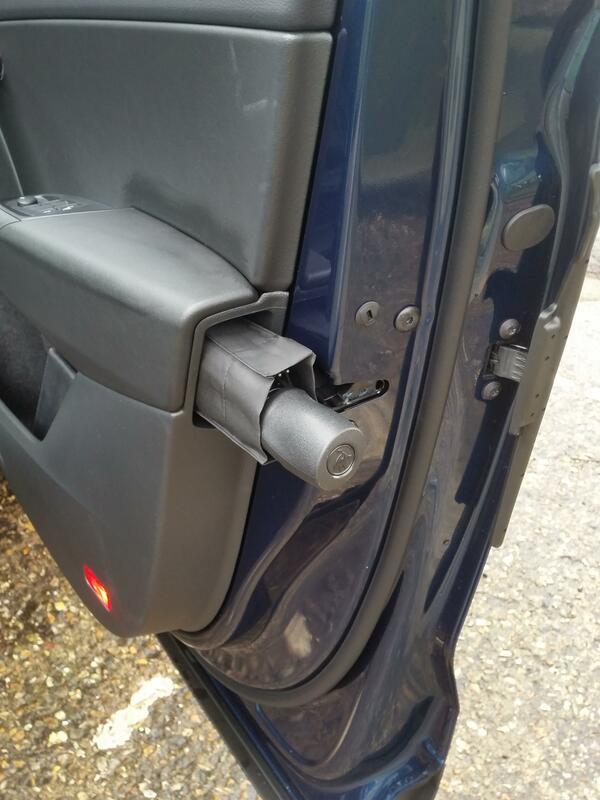 Well the Kuga is now 16 months old and has not missed a beat, however, the sat navy is another story, what a useless bit of kit, it is actually 4 years out of date, I still cannot input my house, M6/M1 junction 4 years out of date. I asked the Ford dealer at the first service to update the system, came back no updates released from Ford, went on Ford site myself and updated the system myself, works better, but still cannot find my house. Good job I kept my old Garmin. If you have an Android phone, have you tried plugging that in and using Waze? It’s effectively updated in real-time, it’s using Google’s mapping data. The same app is available on the iPhone but I believe Apple prevent it being used full-screen on the cars display. Well it is about time I posted an update on my Ford Kuga, it was original supplied by Furrows in Owestry (excellent dealer), we have now moved area our local Ford Bristol Street Motors in Stafford have been A1. The Kuga is now 20 months old with just over 12,000 miles on the clock, basically I have nothing to report not one problem with the car, it still drive and looks like it came out of the showroom, what more could I ask. It is a shame it is only the basic Zetec model but to be honest it does everything we want and more. If you budget is tight don’t discount this model. 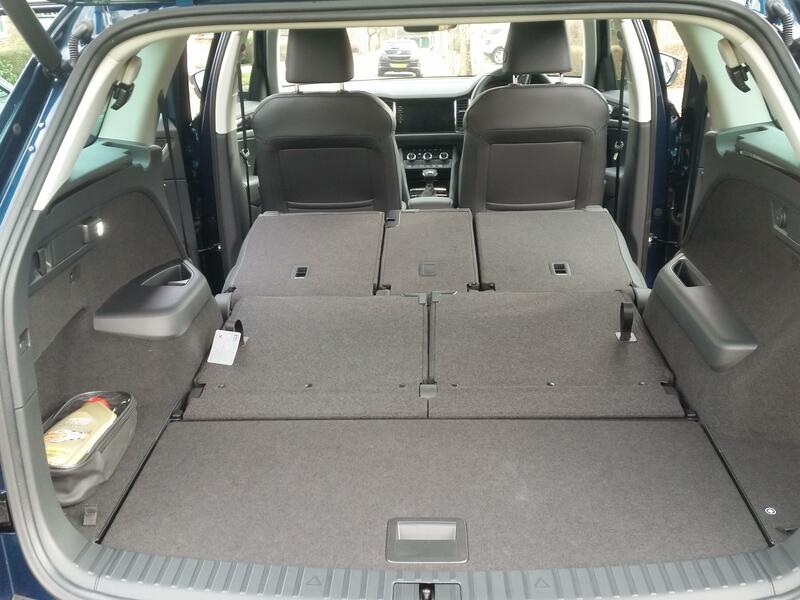 I am keeping my beady eyes on the VW Tiguan Match DSG at present hopefully the AP is kept low and the delivery time improves by the time my contract runs out in May/June 2020. I would have loved the Mitsubishi Outlander PHEV but the AP has financially put it out of my reach, even if I take into account the running cost (My supplier Octopus Energy Go 5 pence kWh rate to charge EV at off peak night rate) it would cost me £0.50 to charge the car up for 25 miles as opposed to about £4.00 using my current diesel car.